Color TV has made us fat! Nope, not just because of the commercials advertising Taco Bell at night nor the fact that we are laying on our couches watching those commercials. The flickering blue light that can be seen each evening pouring out of almost every window in the neighborhood is fundamentally changing our biology. 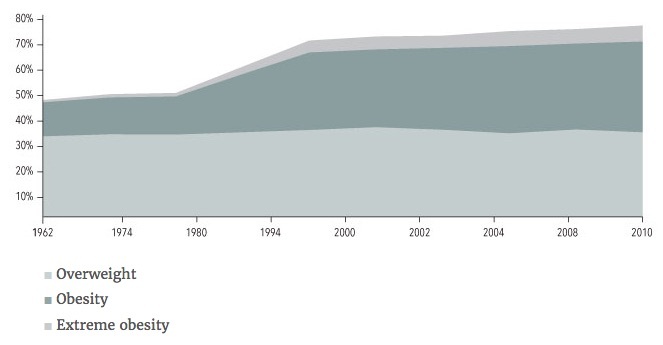 So my argument goes as follows: obesity started to rise right around 1980 in the US, which coincides with color TV’s being in the majority of homes in the US. More seriously: Blue light at night negatively affects health. When you start looking at the increasingly strong evidence that blue light at night is messing us up, it starts to make sense that color television sets pouring blue light into our living rooms each night would affect the population as a whole. Currently, people are exposed to more blue light at night than ever before from phones, tablets, and CFL or LED lights. A study of 100,000 women in the UK found exposure to light at night –even when addressing all confounding factors– to be associated with obesity. A smaller study of elderly Japanese people came to the same conclusion: those exposed to light at night had almost twice the risk for dyslipidemia and obesity. An animal study found that longer exposure to light (16 hours vs 12 hours) significantly increased weight without a change in the amount the animal ate. We can reverse obesity in animals by modifying the light period. Melatonin modulates obesity by affecting the gut microbiome. There is a big link between melatonin levels and type 2 diabetes (more below on the genes involved). A recent animal study reversed type 2 diabetes with a synthetic melatonin receptor agonist. There has always been light at night from moonlight, candles, fire, or even incandescent light bulbs. But those light sources all have very little of the short wavelengths of blue light. The blue wavelengths stop the production of melatonin for up to 2 hours, so exposure in the evening/night from TV’s, tablets, and smartphones delays the onset of melatonin production. [study] It on takes a surprisingly short amount of exposure (15 seconds!) to bright light to delay the onset of melatonin production. So what does melatonin do in the body? Wondering why it is a big deal for melatonin production to be delayed or decreased by light at night? It turns out that melatonin plays a role in several systems in the body. Melatonin was first isolated from pineal glands in the late 1950’s. Eventually, studies were done that associated it with sleep, and synthetic melatonin was first patented and produced as a sleep aid in 1995. Melatonin production is part of our body’s natural circadian rhythm: the level rises at bedtime, peaks around 3 am for most people, and then drops off sharply around 6 am. Although most often thought of as the sleep hormone, melatonin has many more roles than “just” a good night’s sleep. It acts as an antioxidant: “It achieves this action via a variety of means: direct detoxification of reactive oxygen and reactive nitrogen species and indirectly by stimulating antioxidant enzymes while suppressing the activity of pro-oxidant enzymes”. Melatonin also chelates transition metals such as iron. Melatonin is synthesized in the body in a four-step process. It starts with the amino acid l-tryptophan, which we can get from a variety of foods. (This is where we get the idea that Thanksgiving turkey (high in tryptophan) makes you sleepy.) The tryptophan goes through a couple of steps to become serotonin. Serotonin then can be used as a neurotransmitter, or it can be methylated to become melatonin. So there are quite a few processes in the body that can play a role in your melatonin levels including eating adequate protein (tryptophan), producing the right amount of enzymes needed in the synthesis, and having adequate methyl groups available for the final step. When all of the processes are working optimally, the final role in melatonin production is set by the lack of light at night. Some people may be more affected by blue light in the evenings or low levels of light at night — depending on their genes. There is both a genetic component to the amount of melatonin created as well as the interaction with the environmental cues from light. 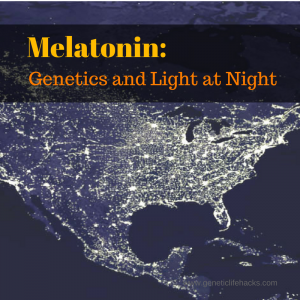 A small recent study looked at haplotypes (groups of variants) for the PER2 gene and found that the ancestral haplotype had less suppression of melatonin when exposed to bright light at night. For this study, most of the variants in the haplotype aren’t ones that are included in 23andMe data. But it is interesting that only those with variants different than the ancestral type were affected by the bright light. Another study looked at the PER3 gene and found a similar effect. Those with a longer version of the gene (PER3 5/5) had a significantly greater suppression of melatonin from blue light, while those without the insertion had less of an effect. Those with the PER3 5/5 genotype also were more likely to be morning-types. Again, this variation isn’t covered in the 23andme data. One PER3 variation that is covered in 23andMe data is rs228697. The G allele is tied to evening preference and the C allele is associated with morning preference. While you might speculate that the C allele here is similar to the PER3 5/5 (morning type, greater suppression of melatonin by blue light at night), there haven’t been any studies that I can find to confirm that. 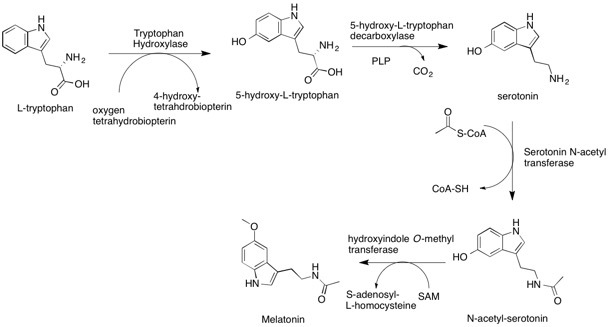 The final step in melatonin synthesis involves methylating serotonin. MTHFR plays a big role in the methylation cycle and the production of methyl groups. Check your MTHFR variants here. Melatonin signals through its receptors to downregulate insulin production at night, so it makes sense that a genetic variation in the melatonin receptor would be linked to the risk of insulin-related problems. Another recent study that looked at different types of diets (high fat/low carb, low fat, high protein, etc) found that for those in the low-fat group, carriers of the rs10830963 G allele had a greater total reduction of cholesterol (LDL) levels. The alkylamine N-acetyltransferase (A/ANA/T) gene controls the rhythmic production of melatonin by the pineal gland. Blocking blue light at night through the use of blue-blocker glasses for several hours before bedtime increased melatonin production by over 50% in just two weeks in a recent study. I am now wearing some really cool looking orange safety glasses at night. For around $10 on Amazon, you too can look like a dork and sleep like a baby! Of course, sleeping like a baby is just one benefit of increasing melatonin, the reduction in risk of chronic diseases such as type 2 diabetes, breast cancer, prostate cancer, heart disease, and mood disorders is the real driving factor for me. Put up some black-out curtains in your bedroom to eliminate light coming in from street lights, cars, etc. I was surprised at the difference it made for me. An easy way to experiment and see the difference for yourself would be to simply hang dark sheets or black trash bags over your windows for a couple of nights. F.lux software will turn down the blue light at night on your laptop and tablet. Bright light in the morning may help balance the effects of blue light at night. Get outside first thing in the morning and exposure yourself to real sunlight. There are some food sources that contain a little melatonin. Tart cherry juice was shown to increase melatonin levels. What about just taking a melatonin pill? A study in older adults looked at supplementing with either .4mg or 4 mg of melatonin. Both dosages raised melatonin levels, but the higher dose (4mg) stayed high longer into the day which could interfere with insulin levels. Later circadian timing of food intake is associated with increased body fat. A study from Sept. 2017 found that eating later (according to an individual’s circadian clock) is associated with higher body fat. Artificial light from digital devices lessens sleep quality. An article reviewing a recent study that showed a 50% increase in melatonin levels after wearing blue-blocking glasses before bed for two weeks. Morning and evening blue-enriched light exposure alters metabolic function in normal weight adults.